Above is a glimpse of Jordan Mitchell in his natural habitat, making music. This year, a notification in a UC Santa Barbara Facebook group prompted me to check out a class that was overflowing with requests for add codes. 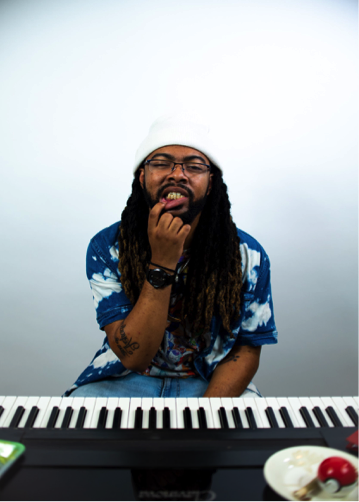 Jordan Mitchell’s College of Creative Studies Music class “Hip-Hop as Orchestration” was in high demand. Music majors at UCSB hogged the comment section, each vying for their own code. Intrigued, I followed the link in the post to the course website, which explained how the course was rooted in classical composition but ventured into the domain of rap and hip-hop. “Students will discuss the technicalities of the two distinct forms and explore how they come together, often looking first at their favorite rap artists,” I read. Jordan will lecture on the theories of classical composition and the roots of hip-hop, leading to the final project where students will produce and analyze their own music, it continued. Wanting to know more about the professor, I clicked on his name and was shocked when it said we were already Facebook friends. There was something familiar about the thickly-woven dreads in the thumbnail photo. Jordan advertised himself in UCSB Facebook groups as a DJ for hire. His page history showed UCSB Music, classical composition, and independently produced music. As it turns out, the course was over four years in the making. Jordan began its development in his first year at UCSB. Now, the College of Creative Studies has approved it for Winter 2019, and Jordan gave priority enrollment to Music majors on a first sign-up basis. The class will be based on that three-tiered approach to exploring the connections between orchestration and hip-hop. But for me, stumbling upon this course marked a reunion of sorts. Jordan and I first met in middle school. He is a year older than I am, but we played in the same school band until he moved cities. Our most notable experience was the impromptu talent show performance we did for our local high school in 2012. Since then we hadn’t spoken or exchanged a message up until the week before the 2019 Winter Quarter at UCSB. I asked Jordan what he remembers about middle school band and the talent show. “[Our band teacher] Mr. Natelli, bro. He helped me out and got me really going with music,” Jordan said, adding that Mr. Natelli stayed in contact with him even after he moved away from our school. Jordan claims that Mr. Natelli’s devotion to his musical talents has driven him to give back to his community in a similar way: “I want to teach kids that look like you and me that their creative sides can be accessed, and not suppressed.” That is part of the reason that he created this music class. Jordan Mitchell and I tried to figure out what connection we shared. We discarded the obvious facts: becoming acquainted in Junior High band class, oddly sharing the same last name, and of course, our coexistence at UCSB. Since our band years, my musical interest has waned while his has waxed. I still have my jams I love listening to. My dad still pressures me to hop on his backup drum set and play some tunes alongside him. But I never felt enriched playing music, and now I’m pursuing a career that I’m crazy about: sports journalism. It’s not like I’m out here creating music classes, or anything crazy like that. Jordan was still taking advice from John Natelli, our former band teacher, on classical composition during his first year at UCSB. Jordan also gleaned what he could about producing from DJ Underbelly, a UCSB legend and certified YouTube sensation known for disc-jockeying and interpolating classical piano sounds into rap and rock sets. I’ve concluded that our connection, the point of Jordan entering and re-entering my life, has to do with the “giving back” that he speaks of. Music drove him to reach a point where he sensed an opportunity to reach kids who were just like him. He heard that writing and producing music would get him nowhere, but he admits that DJ-ing at Isla Vista parties sustained him during trying times at UCSB, both financially and emotionally. For me, music wasn’t my calling. And yet, a mentor, not unlike Mr. Natelli, inspired me to do better for myself and my community. I never thought there would be a field out there that would captivate me wholly like music has for Jordan and so many others. Now, we find ourselves together again at UCSB...for what? Maybe we get to learn how one actually gives back. Jordan will reach kids back home with fresh, innovative approaches to music, just as he is doing at UCSB. I will provide hope to those kids who think that there isn't a job out there for them to love, just as I learned for myself at UCSB. I’m almost certain that after Jordan graduates this year, I’ll run into him again somewhere a couple hundred miles north of here, and his dreads will be even longer. And this time I won’t be as shocked to find him in the same place as me, yet again. After all, we’ve got to do what drives us, don’t we? Phillip Mitchell is a third-year student at UC Santa Barbara, majoring in Communication and currently enrolled in the Journalism for Web and Social Media class in the Writing Program.